Last week, it was reported that the high-end fashion brand Burberry had destroyed unsold clothes, accessories and perfume worth £28.6m last year, in order to protect its brand. That number takes the total value of goods the company has destroyed over the past five years to more than £90m. YouGov BrandIndex data shows that the news of the brands methods – which includes burning excess stock – has caused an initial blow to its public perception. Certainly, people have at the very least noticed the news stories regarding Burberry. Its attention score (whether someone has heard news about the brand) has risen from one to 10. However, the news people have heard is far from positive, with the brand’s buzz score (whether the attention is positive or negative) dropping from one to minus eight. 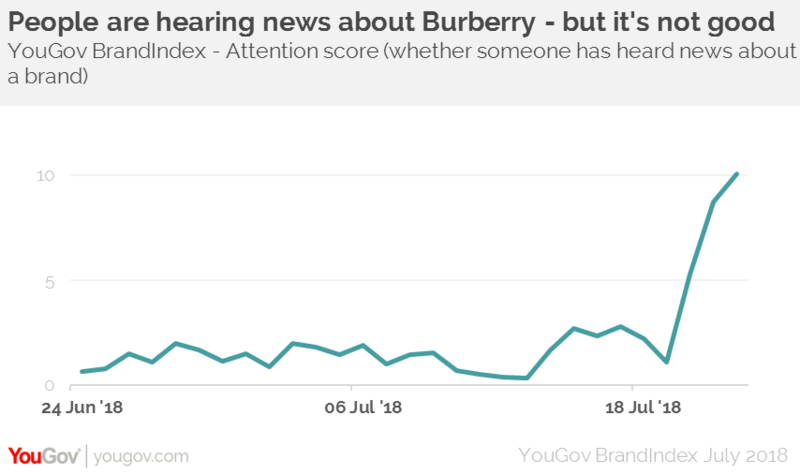 Not only that, but Burberry’s impression score (whether someone has a positive impression of the brand) has fallen by 10 points, from 14 to four since the news was reported last week. Burberry has addressed the issue. It stated that energy generated from burning its products was captured, making it environmentally friendly. Of course, there is also the suggestion that the company wants to ensure the market isn’t saturated with its goods, thereby devaluing the brand. There is a sense that consumers are increasingly keen for retailers to make products environmentally sustainable. YouGov profiles data indicates that over half (56 per cent) of the general public say that: “I don’t mind paying more for products that are good for the environment”. Of course, while YouGov data shows declining brand perception for Burberry, it is unlikely that many of those that now have a negative opinion of the company were in the market for Burberry products in any case. Burberry has worked hard to reposition its brand as ‘exclusive’ over the last few years, and it may be that those who want to wear its clothes are unmoved by the controversy at this time.